TCM created different ads for both Google and Yahoo, in support of Towne Craft's revenue priorities. These ads collectively generated thousands of click throughs, resulting in phone calls and emails. TCM was not interested in attracting customers in Arizona for Towne Craft. We were asked in January of 2007 to create an overall marketing campaign for a new competitor in the southern Maryland custom homebuilding market place. Stu Garlington, president, Towne Craft Builders retained Thieme Creative Media to develop all of his promotional materials that would cover a wide range from print to electronic media. Thieme Creative Media developed a Marketing Plan for Towne Craft Builders that encompassed Target Markets, Competitive Advantage, Possible Corporate Taglines, Current Marketing Situation, Competition, Annual Promotion Costs, Marketing Strategies, etc. We developed Corporate Logo Design, Letterhead & Business Cards, Presentation Folder, Project Signage, Print Media Buy, Website Design & Development, Online Animated Display Ads for Area Portals, Pay-Per-Click Ad Campaigns on Google and Yahoo, and more. The Presentation Folder included the design and layout of multiple handouts that covered such topics as Who Are We, Credentials, References, Design Your Dream Home form, Design Resources and Warranty. All of this collateral was designed and produced in a manner that would be consistent with Towne Craft's overall corporate branding. We utilized the very high caliber printing expertise at Heritage Printing in Leonardtown, Maryland for the Towne Craft project. Heritage Printing, like other printers around the country, prefer to receive our Illustrator, InDesign, etc. files for printing. They find that our technical skills in preparing these files for a printer are superb. 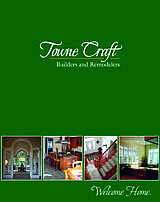 We conceptualized the entire design and organization of all the initial content for the Towne Craft website. The website also reflects our many skills in web development. We provided extensive copywriting skills for much of the site's content. Additionally, we also photographed many of the images seen throughout the site. The digital photography included panoramic interiors utilizing "stitched image" skills. 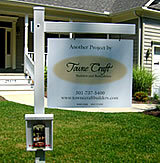 We also utilized XML Flash software, compatible with Dreamweaver for the proper marketing of Towne Craft's historical experience in custom homebuilding. Towne Craft also asked for our guidance in selecting a Web Hosting Company (WHC) for the custom homebuilder's new website. After looking at available WHC's, we selected Hostway in Chicago for Towne Craft's site. As a full-service marketing, graphic design and website development firm, we also designed signage that would be appropriate for temporary placement on active remodeling projects. We also guided Towne Craft in developing an appropriate pocket leaflet that could be picked up by interested passing motorists. Click here for comments from Stu Garlington, Towne Craft's president.